6. Controller of Examinations: 01 Post. a) An academician in the field of Veterinary and Animal Sciences not lower in rank than that of an University Professor. c) Qualifications for an Officer of Government not lower than in rank of Deputy Secretary to Government. e) Experience as part of duties in conducting basic / applied research of high quality as evidenced by published work / technologies developed. f) Knowledge and experience of planning, organising and administering extension activities. Term of appointment shall be five years or till 60 years of age, whichever is earlier. Scale of Pay - Professor scale in UGC Pay Scales, 2006.
a) Recognised Bachelors degree in Veterinary Science Qualification included in first or second to the Indian Veterinary Council Act, 1984 (52 of 1984) and registered with a State Veterinary Council or Veterinary Council of India. b) Ph.D . or equivalent degree in any branch of Veterinary Science. c) A minimum of twenty years of experience in Teaching / Research / Extension in Veterinary Science out of which at least five years should be as Professor / Principal Scientist. d) Significant professional achievements in his / her field of specialization. e) Unblemished record throughout the career in the past. f) Experience as part of duties in conducting basic / applied research of high quality as evidenced by published work / technologies developed. g) Knowledge and experience of planning, organizing and administering academic programs, student evaluation. Scale of Pay – Professor scale in UGC Pay Scales, 2006.
b) Ph.D. or equivalent degree in any branch of Veterinary Science. d) Significant professional achievement in his / her field of specialization. f) Experience as part of duties in conducting basis / applied research of high quality as evidenced by published work / technologies developed. g) Knowledge and experience of planning, organizing and administering academic programs, student evaluation and research programs. h) Experience in Research Station. Scale of Pay - A Professor scale in UGC Pay Scales, 2006.
c) A minimum of twenty years of experience in Teaching / Research / Extension in Veterinary Science out of which at least five years should be as Professor / Principal Scientist cadre. g) Knowledge and experience of planning, organizing and administering extension activities. a) Recognised Bachelors degree in Veterinary Science Qualification included in first or second schedule of the Indian Veterinary Council Act, 1984 (52 of 1984) and registered with a State Veterinary Council or Veterinary Council of India / Fishery Science / Dairy Science / Dairy Technology. b) Ph.D. or equivalent degree in any branch of Veterinary Science/ Fishery Science / Dairy Science / Dairy Technology. c) A minimum of twenty years of experience in Teaching / Research / Extension in Veterinary Science / Dairy Science / Fishery Science out of which at least five years should be as Professor / Principal Scientist cadre. f) Training & Experience in organising co-curricular & extra- curricular activities. g) Wide experience of student problems, management and Placement. h) Two years experience as Academic Advisor. 2. For reckoning the required experience for the post, the experience in the concerned subject or discipline in teaching or extension or research shall only be considered as relevant experience. 3. Certified copies of degree or provisional certificates and marks sheet / transcripts should be enclosed to the application. The originals should be brought at the time of interview. 4. Applicants should send their application through proper channel so as to reach the University within the prescribed date. The in-service candidates of PVNRTVU may send their applications directly. 5. Applicant should appear for interview, when called, at their own cost. 6. 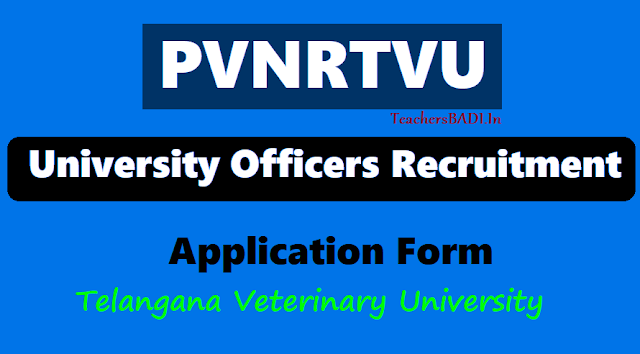 Selected candidates will be governed by SVVU (Conditions of Service) Regulations, 2007 which was adopted by PVNRTVU and such other conditions as may be prescribed by the University from time to time. i) Employment Record (details of service rendered by the applicant in different cadres clearly with name of the organization, cadre, scale of pay, period including date, month and year) in the following format with attested copies. ii) List of publications (as first, second, third and fourth author: with the information regarding title of publication, year, nature of publication, name of the journal / publication, Vol. & Pg. Nos. & Place of publication of journal / book etc.) in the following format separately for research papers and short communications along with reprints. Vol. No. & Page Nos. Place of publication of the journal / book etc. iii) Enclose Annual Confidential Reports for the past 5 years from the head of the institution. The filled in application form together with Registration Fee by way of crossed Demand Draft drawn in favour of The Comptroller, PVNRTVU, Rajendranagar, Hyderabad on any Nationalized Bank payable at Rajendranagar should be submitted in person or sent by Registered Post so as to reach The Registrar, P.V.Narsimha Rao Telangana Veterinary University, Administrative Office, Rajendranagar, Hyderabad on or before 19.03.2018.